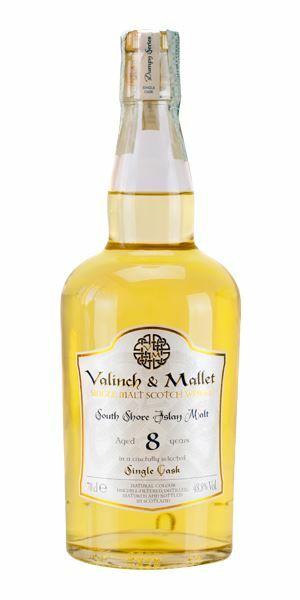 This week’s reviews take Dave Broom through a quad of Caol Ilas, bookended by a calm Bunnahabhain and a mystery malt known only as South Shore. A 1989 single cask bottling of Bunna’ from HAH has Broom dreaming of Scottish holidays with a particular lady in mind – though she’d have to make way for his sweet tooth. 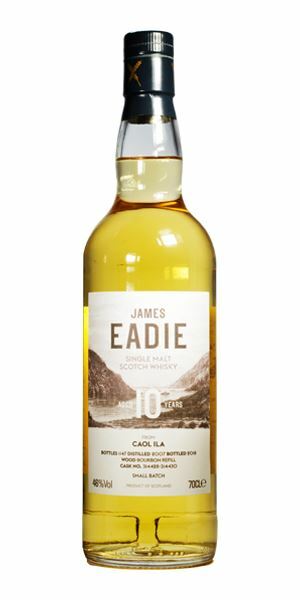 The first in a progression of Caol Ilas, and the youngest of the set, is a ‘youthful’ 10-year-old bottled by James Eadie, which is ‘built for impact’ but delivers on flavour nonetheless. 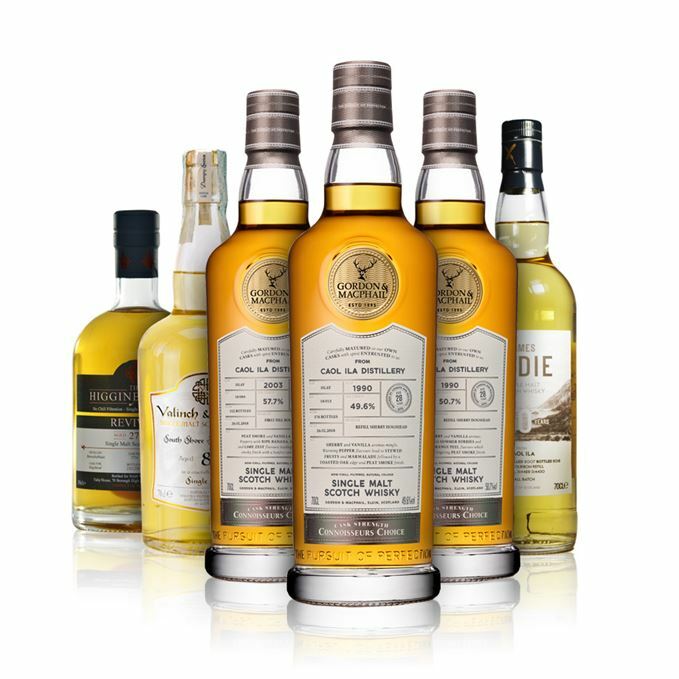 Moving on now into three older expressions from Gordon & MacPhail’s Connoisseurs’ Choice range – a 14-year-old from 2003, and two 28-year-old twins from 1990. It’s a meaty start, which shows Caol Ila ripen from a punchy, briny whipper-snapper into a layered, oily number that’s hit early maturity. ‘Brilliant,’ says Broom. 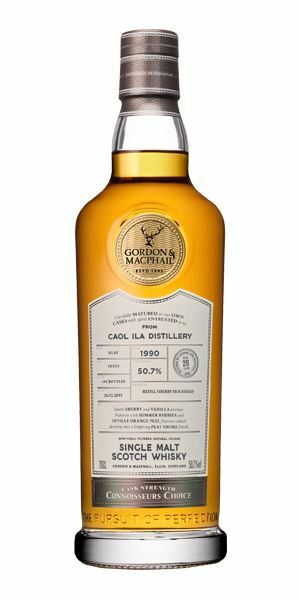 Similar high praise ensues for the first 1990 twin, where Caol Ila has reached peak maturity with a ‘richly resinous’ quality, but while still impressive, the second twin is a drier experience, and ‘slightly austere’. Once Broom is done with Islay’s east coast, he heads to the South Shore, to a fragile, fragrant eight-year-old single malt from an unnamed distillery that’s perhaps bottled just slightly too soon. This week’s accompanying playlist has a distinctly salty edge. Follow the links in the Right Place, Right Time notes. Gentle and lightly nutty, with a not inconsiderable hit of russet apple mixed with Edinburgh rock (peppermint, lemon and a dash of cinnamon) and some scented blossom. Things develop sweetly with the emergence of vanilla ice cream (with wafer), strawberry tart, and then honeycomb. This is low strength so water isn’t really necessary, and while you do get more of the lemon zippiness, the overall effect is slightly flattened. 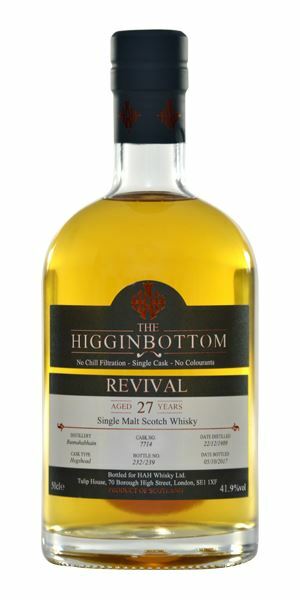 A lightly toasted cask influence comes over initially, but backed with real sweetness, then vanilla pods pricked with lemon zest. It has a gentle flow, mixing together soft fruits – apricot especially – and light syrup notes balanced with some roasted nuts, candied kumquat and light nutmeg. Water softens things further and while you lose the overall lusciousness, you do pick up some signature preserved ginger. A walk in the gloaming with a Lady Of The North. Full-on smoke from the start with a background of old-fashioned lemonade, and a grassy/ vegetal element (espadin mezcal). It becomes slightly drier as it opens, and a more seashore-like aspect begins to emerge: drying salt, sea-soaked clothes. This salinity eventually becomes dominant, but the background fruit keeps things balanced. Water does bring out some slightly awkward, angular wood and some sea-washed pebbles. Smoky, yet sweet, to start. The lemonade has now changed to Jamaican ginger beer elements which are given extra pep by the salty freshness. There’s just sufficient of the distillery’s characteristic oiliness to soften things down in the mid-palate. The smoke is balanced, adding even more of the mezcal-like touches. Dilution shows the bite of youth, as well as the slight gawkiness picked up by the nose. Oyster brine, burnt timbers, smoked vanilla. Fresh off the boat came the Salty Boys. Rounded and soft, with some mature elements. More aromatically herbal than the Eadie with some lavender, and the smell of warm salty skin lying on a goose-down pillow. It opens up to Douglas fir sap, rose, meadow hay, and gentle smoke. As it develops (and with a judicious amount of water) first you get pear and then lardo – cured smoked bacon fat – which is itself somehow balanced by raspberry ripple ice cream, dry coconut flesh, and a hint of dunnage warehouse. Already mature, and wonderfully oily, with a mix of sesame and mustard oils. Then the lardo kicks in (plus a spicy, peppery kick) helped along by the high strength, that’s backed with a more savoury element: char siu pork with cockles. Water moves this to one side and brings out vanilla, soft peachy fruits and a honeyed oiliness that slides towards a salty back palate. Silage, damp grass, smoke, spice, and salt. If the Eadie was Caol Ila in its muscle-flexing youth, here it has hit an early maturity where layers of seemingly opposing flavours meld together perfectly. Available in the UK and Europe. Brilliant. A barbecue by the Sea. The cask has steadily advanced (and changed, as we’ve now got a refill Sherry hoggie) and as it has so the phenolics have been absorbed, the fire seemingly smoored, leaving behind some cigar ash, wrapper leaf and burnt stick. There are glimpses of grassiness still, while the once-sweet fruit is cooked, and there’s a new medicinal element (antiseptic cream). It’s the leathery mature elements which have the upper hand, while a dusty angelica element hangs around at the back. Water brings the fire back to life, and the smoke starts up once more. Has an amazingly sweet start, but there’s now an added resinous element: polished wood, beeswax, olde English marmalade and redwood forest. There is also considerably more smoke than on the nose (a bonfire in the woods) which adds a rounded and layered quality. As it develops, so the scented woods come through, then just as you start dreaming of a high-class cigar lounge, a dried salty kick boosts you back to the shores of Islay. Water brings out some walnut, while the resin just grows in power. Now at full maturity, the flavours begin to fold into one another and a new, richly resinous and resonant quality takes over. This is destined for Asia and Oceania. Lucky you! Caol Ila shifts over to The Shadow Side. A slightly drier impact with less cask influence than the previous example, some wet oilskins, hazelnut butter, light toffee and dried mint. Things continue in this slightly lean vein: dry crab shells, dried seaweed and light tobacco, then a daikon-like aroma. Water brings out briary dark fruits. As with the nose, this starts dry with a light nutty note. Hotter (embers in the mouth) and slightly austere and enigmatic. Initially, the smoke seems to be more carbonised. The oils are still there in the centre – rapeseed this time – while the cherry pipe tobacco smoke swirls around. Water brings a greater coherence, albeit with drier tannins, and a burst of red fruits. The effect is like a fire in a pick your own fruit woodshed. Refill hoggie again, but a less active example. Destined for Asia and Oceania once again. A fascinating chance to try Caol Ila at so many different stages of its evolution. Walking the shore shedding Tears For Lot’s Wife. Pale, dry, and crisp from the off, with a phenolic rather than overtly smoky edge: soot and an old campfire. Although there’s a sense of fragility, there is sweetness behind, with ginger, some mossiness and then a little seashell. Precise and quite intense. Be careful if you’re adding water, but you do get a foggy smokiness and some damp tweed. An interesting topnote of bog myrtle and dog rose cut with light smoke. That impression of fragility is borne out here, but there’s good balance, light acidity, and a sea-washed cleanliness which brightens the palate. It develops a fragrant, almost perfumed quality akin to bay oil and bog myrtle, along with a zesty bite. Water lightens things considerably adding in a slight nuttiness, but I’d just knock it back neat. Light smoke, a little short and dry. Light but balanced. I’d probably have held onto it for another couple of years. Batch 161 17/08/2018 Another investigation of a single malt at varying ages. This time, it’s Glenrothes’ turn.